At least temporarily. This week on CTG, Daphne identifies the culprit: the Central Texas Leaf-Katydid (Red Katydid). She explains that in cyclical outbreak years like this one, the red form predominates. Thank you to Paul Alvarado Lenhart, Ph.D candidate in the Texas A&M Entomology Dept. for pictures and information. They’re defoliating oak trees and singing their little forewings out. Not to be confused with cicadas, these insects are Paracyrtophyllus robustus. Lee Franzel, Comal County Master Gardener, has seen a lot of them! On Mike Quinn’s Texas Entomology site (fabulous insect resource) he notes some factors for this year’s abundance of many insects: the 2011 drought that killed off natural predators, and our warm winter with above average rain. Many thanks to him for his assistance on this segment! Here’s one more, taken by Alan Brown, an entomologist himself, though we usually meet the whole family through Texas AgriLife Extension’s Wizzie Brown’s Urban-IPM blog, a great resource for what’s bugging you! Most of the time, she’s answering gardeners’ questions and conducting free workshops, like this one on July 14 to identify good bugs and bad ones. Hear some spine-tingling tales about Wicked Bugs with author Amy Stewart when she joins Tom this week! Amy astounds us with captivating stories from insect strategy to why Tom got nabbed by a black widow spider. And did you know that locusts are actually certain grasshoppers under stress? From Phylloxera that almost wiped out a wine industry to zombies and bed bugs, Wicked Bugs is full of intriguing true tales of the insects that changed history, from Napoleon to families under attack by the Brown Marmorated Stink Bug today. Amy emphasizes that most insects are beneficial and deserve our respect (no pesticides) and our nurture (a diverse habitat to attract them). Most important: if we don’t edit who gets to come in, we have far less work to do. Generally, the creatures will “work it out” themselves and we don’t mess up the valuable predator-to-prey balance or destroy beneficial pollinators. If you must step in, do it with your foot or your hands. This spring, when insects exploded all over, you may have spotted this one on your mint or lamb’s ears. It’s the White-Margined Burrower Bug (Sehirus cinctus). But any damage they did has recovered nicely by now. In Wicked Bugs, Amy notes that “Lepidopterophobia” is fear of butterflies. But since most of us love them, Daphne’s pick of the week, native Gaura lindheimeri, attracts both butterflies and hummingbirds. Gaura’s pretty much no care, too. Once established in well-drained soil, it needs little water and no fertilizer to bloom from late spring through summer. It loves sun, joined here with native Zexmenia (Wedelia texana) in this Hyde Park garden. Gaura can take some shade too, but mine didn’t fare well once my trees grew up too much. Gaura lindheimeri ‘Siskiyou Pink’ is another beauty. In winter, you can cut them back to encourage bushier growth in spring. In blooming season, cut off spent flowers to encourage another flush. Succulent plants don’t attract too many wicked bugs (usually). This week Eric Pedley from East Austin Succulents demonstrates how to divide by leaf cuttings and beheading. Yikes, “beheading” sounds scary, doesn’t it? Note: no blood was shed on this episode! 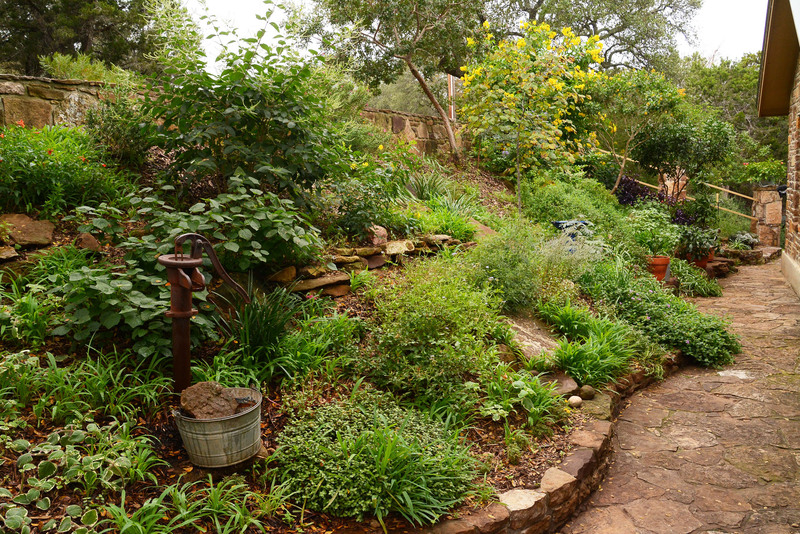 On tour, this garden designed by Travis County Master Gardener Link Davidson for neighbor Wendy Brennan restored wildlife habitat in a very small space. See how they used recycled materials to repurpose the former lawn, on a wickedly low budget.